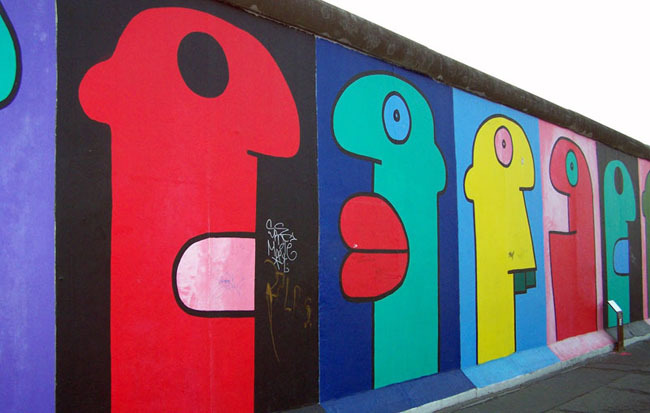 Street Art London is hosting the iconic Berlin street artist Thierry Noir as he makes his London debut. Noir is a forerunner of the modern street art movement, famous for being the first artist to continuously decorate the Berlin Wall illegally from 1984 to pre-empt its ultimate fall in 1989. Street Art London is joining forces with prominent London street artist Stik to welcome Noir and introduce his art to the walls of Shoreditch and Dalston. The culmination of Street Art London’s programme of events will see Thierry Noir combine forces with Stik in painting a collaborative mural on the prestigious Village Underground Wall. 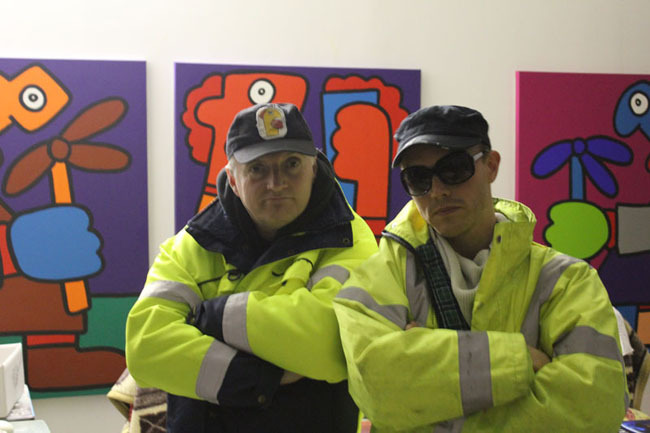 On the 21st of February Noir and Stik will be exploring the continuum of street art history, the old school and the new school, within the broader context of art history at a talk in association with Street Art London and The Courtauld Institute of Art at Somerset House. 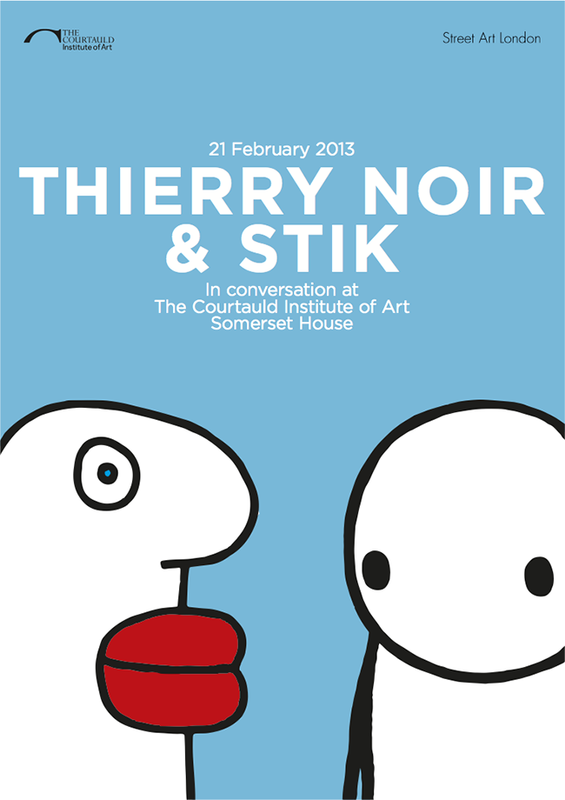 Noir and Stik, in this public talk will explore their own artistic experiences, motivations and influences. 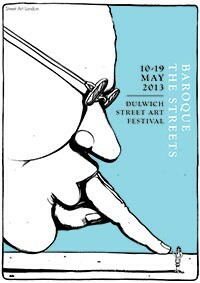 The purposes, origins and future direction of street art will also be debated and considered by both artists. 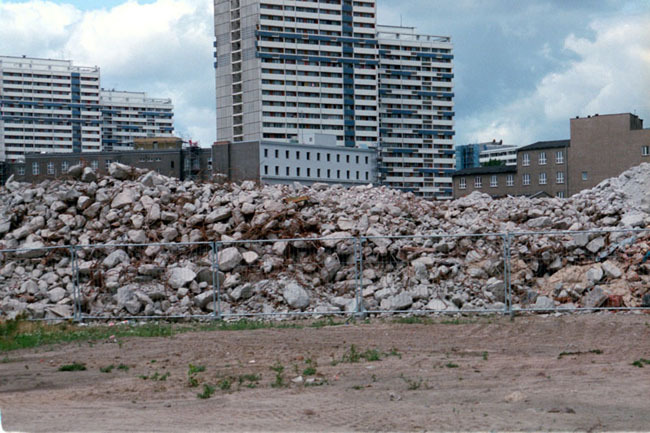 The talk will be chaired by Richard Howard-Griffin (Principal of Street Art London) and Hannah Zafiropoulos (Courtauld Institute of Art). The Courtauld Institute of Art, Somerset House, London, WC2R 0RN. 21 February, 7:30PM (drinks reception afterwards). Tickets free but limited. 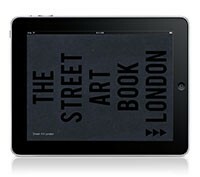 RSVP to hello@streetartlondon.co.uk. 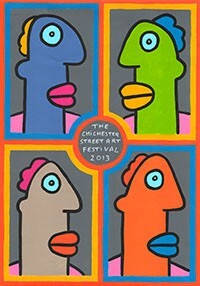 Signed editions of screenprinted commemorative Thierry Noir and Stik poster (detailed below) will be available at the event. Noir and Stik will follow on from Pablo Delgado, Phlegm and Kid Acne at the Village Underground Wall presented by Street Art London. The mural that both artists will paint together will form a very special collaboration as kindred styles and ideologies from distinct generations meet face to faceon the same wall. 19-20 February, Holywell Lane, EC2A 3PQ. 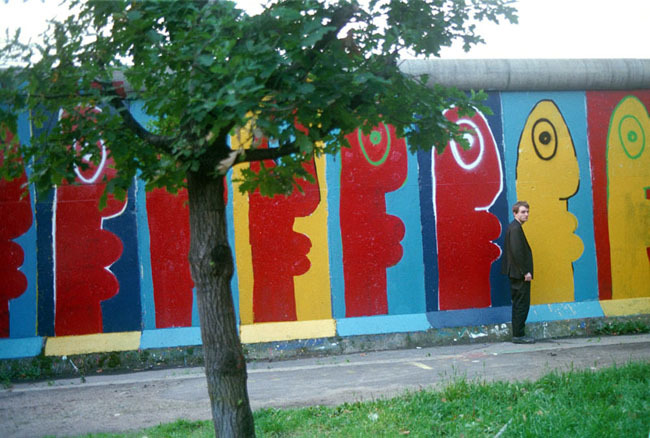 Thierry Noir was born in 1958 in Lyon, France, and came to Berlin in January 1982. In April 1984, Noir began to paint the Berlin Wall with Christophe Bouchet, in order to perform one real revolutionary act: To paint the Berlin wall, to transform it, to make it ridiculous, and to help destroy it. They covered the wall, more than 3 metres high, with bright, vivid colours, aiming not to embellish the wall but to demystify it. 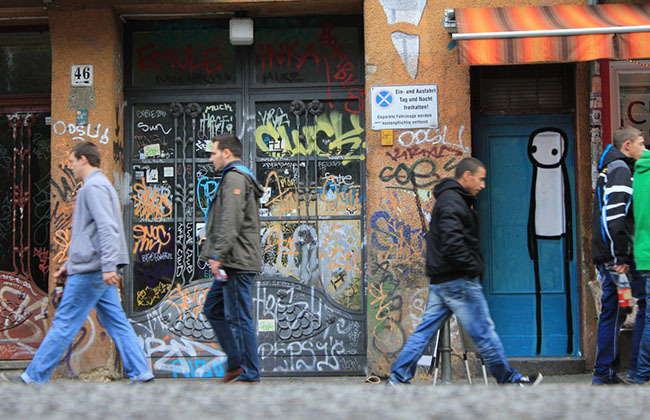 In Berlin, Noir lived metres from the Wall – his vivid murals were both a personal response and a poignant political statement. 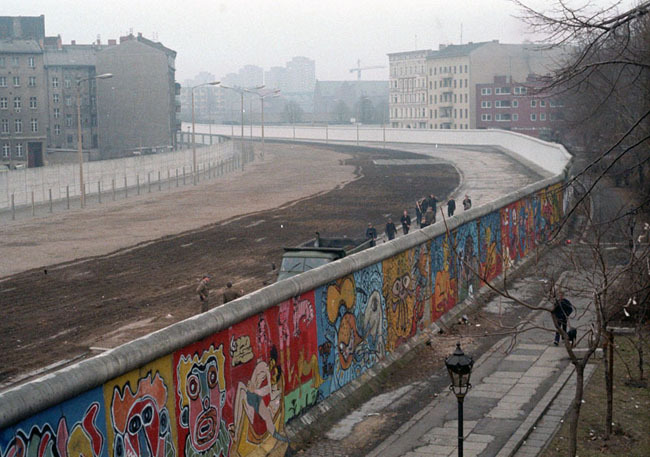 Painting on the wall was absolutely forbidden; it was built 3 metres beyond the official border so the east-German soldiers were able to arrest any person standing near it. Noir had to paint as quickly as possible, using the recipe of ‘two ideas, three colours’ as a celebration of the ‘eternal youth’. Despite their bright colours and playful nature, the murals leave a lingering sense of melancholy: As Noir says, “I did nothing but react to its sadness”. 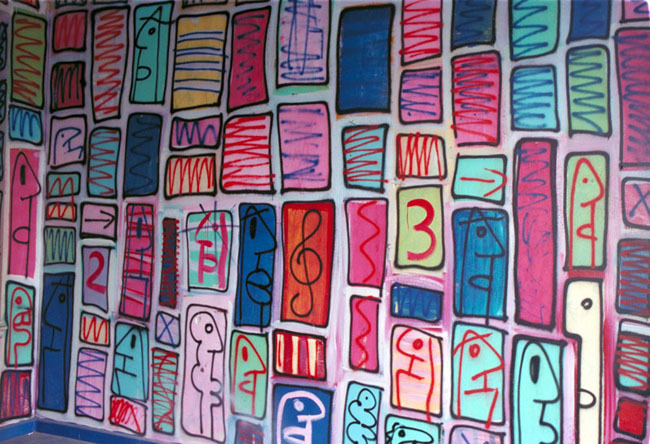 After the Berlin Wall came down in 1989, his paintings became a symbol of new-found freedom after the reunification of Germany and the end of the Cold War.The fall of the wall gave birth to the East Side Gallery, a 1.3 kilometre stretch of wall upon which 118 artists from 21 countries applied their designs. In 1990, Noir painted 16 of his infamous faces on the wall, leaving a lasting testimony for future generations. Stik painted his characteristic figures on London streets illegally for years and was instrumental in raising the British public’s appreciation of street art. Today, he paints murals across the UK, Europe, Asia and America in association with organisations such as The British Council, Dulwich Picture Gallery, Amnesty International and the Big Issue Foundation. Where is that first image taken? I am contacting you in the hope you could possibly help me in my persuit to find Stik the London street artist, I really need to discuss a project matters with him. It’s great to see that graffiti is becoming more socially acceptable, and venturing more into the ‘street art’ category.